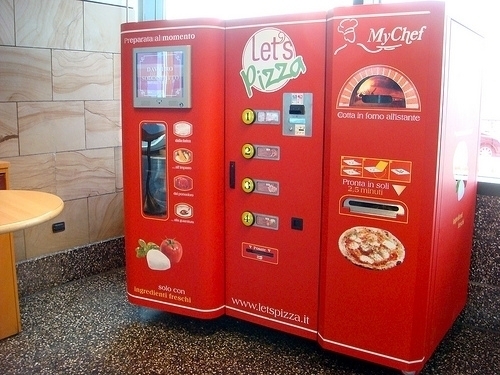 Most college students would deem a pizza vending machine too good to be true; however, technology has graced the world with a vending machine that cooks you a fresh, not frozen, custom pizza in less than 3 minutes. -The machine makes fresh dough from scratch by combining mineral water with a flour mixture. -The machine then kneads the mixture into dough, and flattens it into a 10 inch pizza. -The pizza is now topped with organic tomato sauce via a mechanical arm. -This mechanical arm now tops the pizza with cheese and any additional desired toppings. -Each machine has 3-4 topping choices, such as: pepperoni, bacon, mushroom, etc. -This ENTIRE process takes under 3 minutes, and each pizza is priced at $5-%6. This phenomenal machine originated in Italy back in 2009; it slowly made its way through the U.K., and is beginning to integrate itself into the American vending tradition. The A1 concept company that manages ‘Let’s Pizza’ announced its plans to create a ‘Let’s Pizza’ headquarters here in the US in 2012. The plan was to have these vending locations in malls and universities around the nation, but none have breached the market yet.